I am asked regularly by clients what types of links are best for their affiliate program and I give the same answer, it depends. What do I mean it depends? Every affiliate promotes a merchant differently. For example, some use text links embedded within content, while others prefer banner ads to help convert traffic from their site. I would never say go with one over the other, as both are essential to the growth of an affiliate program, but I would do an analysis of your current creative inventory and see what links and banners are being used more frequently and supply your affiliates accordingly. If you are thinking of starting an affiliate program then I would say have both text links and the most popular banner sizes available for affiliates. Rakuten Marketing conducted a link performance report across the Rakuten Affiliate Network from October 2013 – June 2014 to see what types of links are most effective for merchants. Please note that this data is specific to Rakuten Affiliate Network and could vary depending on the network. The report from Rakuten Marketing provided the percentage of sales by link type and the percentage of sales by banner size. 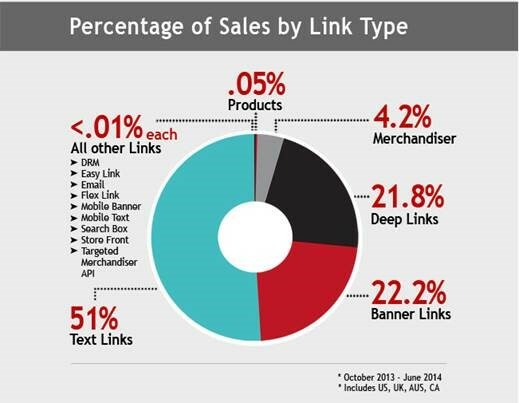 They found that 51% of sales occurred using a text link and another 22% using banner links. Does this mean you should not offer any banners or even decrease the amount in your creative inventory? Absolutely not! Offering affiliates a selection of the most popular banners will do, but be prepared to create additional banners if an affiliate requests a size not currently available. 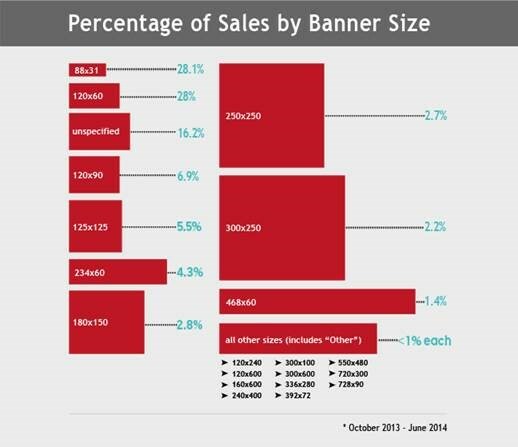 According to Rakuten Marketing, over 56% of all sales from banner links resided from two sizes in particular. The 88×31 (28.1%) and 120×60 (28%) were by far the most popular for affiliates and also generated the most sales. Both the 88×31 and 120×60 banners are popular among coupon and deal oriented affiliates as are text links, but text links are also very popular among content affiliates. When deciding how to stock your creative inventory it is wise to provide the most popular banner sizes (88×31, 120×60, 125×125, 300×250) and create text links that include your brand name and all coupons/deals and popular keywords associated with your brand. By equipping your affiliates with the most popular creatives it will save time creating banners that will never be used by affiliates. Previous PostPrevious Affiliate Coupon Landing Pages: Why They Are Important?